The term epi is derived from the Greek prefix meaning upon, on, over, or beside. Epigenetics looks at the extra layer of instructions that lie over or on top of DNA that control the way genes are expressed. All cells in the body contain the same genetic code. Yet each of these cells have different structures and functions. A heart cell, for example, is very different from a nerve cell. Epigenetics seeks to understand how this happens. It explores how certain chemical tags attached to different parts of DNA and its associated proteins can activate or silence genes. Such chemical changes are known as epigenetic modifications. This process does not alter the underlying genetic code. Instead it controls which genes are turned on or off in individual cells which determines the specific structure and function of the cell. Epigenetic modifications also help explain differences found between identical twins that share the same genetic code. The epigenetics mechanism plays an important role in the normal development of the cell and maintaining the body’s equilibrium or homeostasis. Any disturbance of the epigenetic process can have major adverse health and behavioural consequences. This can be affected by internal imbalances within the body itself and wider environmental and lifestyle factors. Most epigenetic changes only occur during the lifetime of the individual organism. Such modifications, however, can have long-term effects and be passed on to offspring and subsequent generations. Lights marking where methtyl group molecules are binding to two cytosines in a DNA molecule. DNA methylation is one of a number of epigenetic mechanisms that cells use to control gene expression. It plays an important role in the normal development of cells and cancer. Credit: Christoph Bock, Max Planck Institute for Informatics. Epigenetics has been a growing field since the mid 1970s. The pace of epigenetic research picked up significantly from the early 2000s. Some idea of the speed with which this happened can be gauged from the database of ISI Web of Knowledge. Between 2000 and 2010 the number of articles listed in the database that contained the word ‘epigenetics’ in their title grew from 100 to 1300. A more recent survey carried out by Enal Razvi and Gary Oosta of the number of epigenetics-focused scientific publications showed that this had an annual growth rate of 12.5 per cent in the years between 2012 and 2015. Interest in epigenetics has been fueled by accumulating evidence that epigenetic mechanisms underpin a wide variety of illnesses, behaviours and other health issues. Epigenetic changes are now associated with a wide range of diseases. This includes nearly all types of cancer, plus respiratory, cardiovascular, autoimmune, reproductive and neurodegenerative disorders. Many factors are suspected of causing epigenetic modifications. Lifestyle behaviour such as diet, sleep and exercise are now known to cause change, as is exposure to heavy metals, pesticides, diesel exhaust, tobacco smoke, radioactivity, bacteria, and viruses. The public visibility of epigenetics was increased by the establishment of the Human Epigenome Project (HEP). This is an international project that was launched with government funds and private investment in 2010 as a sequel to the Human Genome Project. It was set up to map DNA methylation and other epigenetic markers throughout the human genome so as to further understand gene regulation in development and disease. By 2015 the group had uncovered key information about functional elements that regulate gene expression in 127 human tissues and cell types. Epigenetics is already making its mark in the clinic. Four drugs have already been approved by the FDA to reverse aberrant epigenetic changes that cause cancer and many more in the pipeline. A number of studies suggest that DNA methylation inbibitor drugs help increase the sensitivity of tumour cells to immune checkpoint inhibitor therapy. Many diagnostic companies are also developing tests, many using antibodies, to detect epigenetic biomarkers for diseases like cancer. Just how far the field has progressed can be seen from the fact that in 2016 analysts from Grand View Research predicted that the global market for epigenetic products would each USD 16.31 billion by 2022. The term ‘epigenetics’ was first coined in 1942 by Conrad H. Waddington, a British developmental biologist, embryologist and geneticist at Cambridge University. When Waddington first used the term little was known about genes and their hereditary role. Until the 1950s the term was used to describe the events that helped a fertilised egg to become a mature organism. By the mid-1980s the meaning of the word had become more precise being used to describe heritable traits that do not involve any alterations to the underlying DNA sequence. One of the first epigenetic mechanisms to be identified was DNA methylation. This is a chemical process that involves the addition of a single carbon and three hydrogens, known as a methyl group, to a DNA strand. The methyl group addition changes the activity of a DNA segment without altering the DNA sequence. It is known as an ‘epigenetic mark’. Methylated cytosine was first detected in a preparation of calf thymus in 1948 by Rollin Hotchkiss at the Rockefeller Institute of Medical Research, New York. It would take time however for researchers to work out what purpose the modified cytosine served. In 1969 John S Griffith and Henry R Mahler based at Indiana University suggested that it might help with memory storage in the brain. 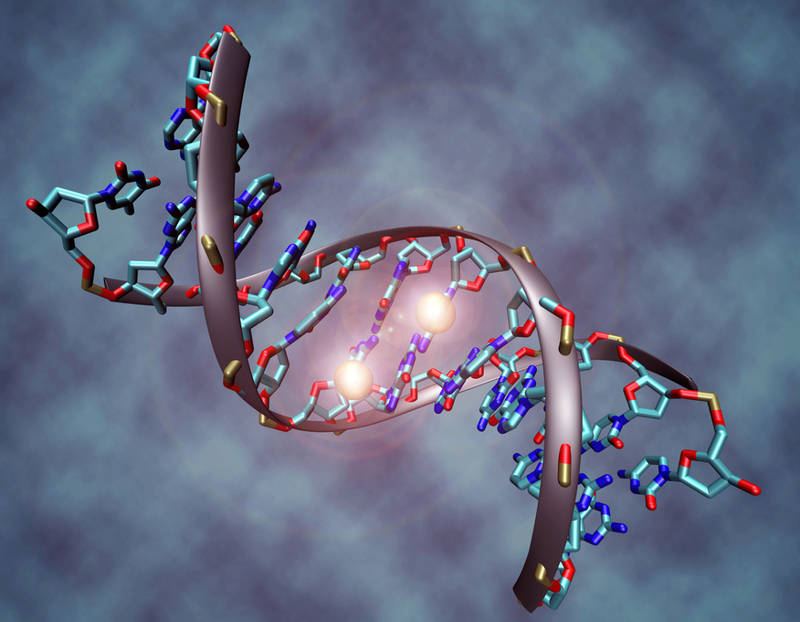 This was the first time DNA methylation was linked with a biological function. By 1975 three different groups independently suggested that DNA methylation could play a role in switching genes on and off during biological development. One was led by Arthur Riggs at the City of Hope National Medical Center, California, another by Robin Holliday at the National Institute of Medical Research, London, and the last by Ruth Sager at Harvard Medical School. By the 1990s experimental evidence began to emerge that backed up the hypotheses about the relationship between DNA methylation and gene expression. This was helped by the development of techniques in the 1970s which enabled scientists to clone and sequence DNA. Research in the area was further aided by a method devised by an Australian group of scientists led by Marianne Frommer. This technique made it possible to isolate methylated cytosine residues in individual DNA strands by treating the DNA with the chemical sodium bisulphite. Together with the amplification of DNA by PCR, and the rise of genome sequencing technology, the bisulphite method provided the means to investigate DNA methylation and its impact on gene expression on an unprecedented scale. This could be done in pathological samples. Epigenetics research was further enhanced by the development of microarray technology and improved staining techniques using antibodies. One of the key discoveries was made in 1985. That year Adrian Bird and his team at Edinburgh University demonstrated that DNA methylation did occur at random and took place on specific segments of DNA known as CpG islands. For a long time it was not known what the significance of this was. It subsequently emerged that methylation of CpG islands was instrumental in suppressing a gene. The epigenetics network is now known to have many layers of complexity. Two main types of epigenetic modifications have identified. The first type, which involves DNA methylation, modifies genes, these are small sections of DNA which provide the instructions for creating a protein. DNA methylation always silences the gene. The second type of modification affects histones, a specific protein that DNA winds round. Histones help compress the long DNA molecule so that it can fit into a cell’s nucleus cell. Modification of the histones can either tighten or loosen the DNA coils. The tightness of the coil affects how much a gene is exposed or hidden from the cell’s transcription machinery. Different chemical tags added to the tail of the histone have been found to affect this process. These tags include acetyl, phosphate or ubiquitin molecules. It is not yet known exactly what types of modifications help open or tighten the DNA coils, but the acetylation of histones is known to unwind DNA and increase gene expression. With the help of new genome technologies, numerous diseases have now been linked to epigenetic disruptions, especially ones influenced by the environment. One of the first diseases to be linked to epigenetic changes was cancer. In the late 1970s Holliday and Pugh demonstrated that hypermethylation of DNA resulted in changes to normal gene regulation which led to cancer. In particular they showed that hypermethylation silenced tumour suppressor genes. Based on this a number of cancer drugs have been developed to inhibit DNA methylation. The first such drug was Azacytidine (Vidaza). This was licensed by the FDA in 2004 for the treatment of blood cancers. Its approval marked a major milestone in the development of epigenetic cancer therapy. Since then two other DNA methylations inhibitors drugs have been approved. Three drugs have also been approved that inhibit history deacetylation. Yet, despite their success the new epigenetic drugs have certain drawbacks. The DNA methylase inhibitors, for example, have poor chemical stability and can cause severe toxic side effects in patients. In addition to new treatments, epigenetics has opened up a new strategy for diagnosis. The chances of beating cancer are greatly improved if the disease is detected at an early stage. Diagnosing cancer early, however, is not always easy. Efforts are now underway to develop tests that can identify the presence of molecular epigenetic markers in a patient’s biological fluids to identify precursor lesions or cancer at its earliest stage. These rest on detecting abnormal DNA methylation patterns in specific genes, histone signatures and altered expression in small RNA molecules. Epigenetic markers are not only being sought for the early detection of cancer. They could also prove useful in the clinical management of patients. In 2000 it was shown that methylation levels in brain tumours could help predict patients’ responsiveness and sensitivity to certain chemotherapies. Epigenetics research has become an indispensable tool for determining gene-environment relationships that affect risk exposure, therapeutic benefit and disease progression. Yet, despite its importance, many scientists continue to debate the parameters of epigenetics and whether this should be confined to just changes that take place at the gene level. Some are also concerned about our capacity to identify a risk. At what point, for example, can we judge when a cell or tissue has altered so much that a patient has the risk of the onset of cancer, a recurrence, tumour progression or developed resistance to treatment. Similarly, a number question the extent to which epigenetic information can provide new avenues for treatment or cures for cancer. In addition, the field is still relatively young so we still do not fully understant the full set of benefits and limitations of therapy inherent in altering epigenetic pathways. T.B. Johnson and R.D. Coghill reported detecting a minor amount of methylated cytosine derivative as byproduct of hyrdrolysis of tuberculinic acid with sulfuric acid but other scientists struggled to replicate their results.